We have made several M5 CHR seats now. Last Fall we moved to a design for 6' and taller riders that allows the seat rib to lay on top of the frame. 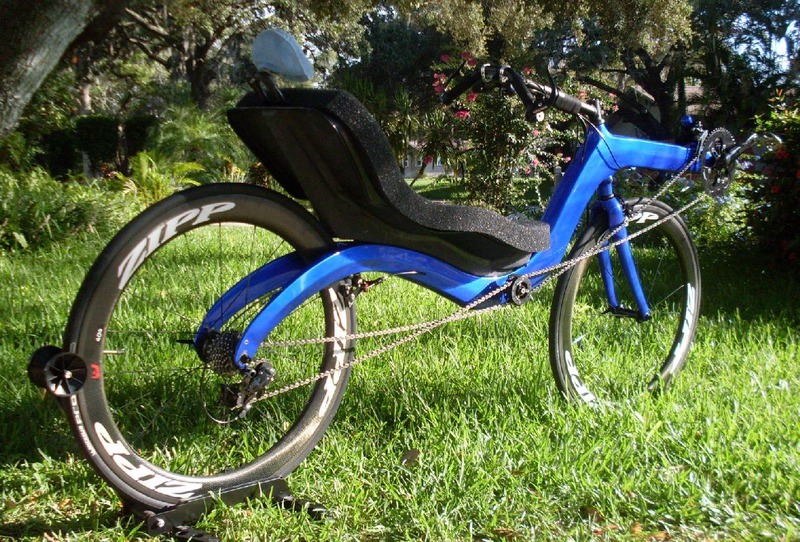 The seat and the frame are separated by 2" industrial Velcro that runs the length of the rib where it would contact the frame in order to both protect the frame and to somewhat bond the two together for slightly higher performance. 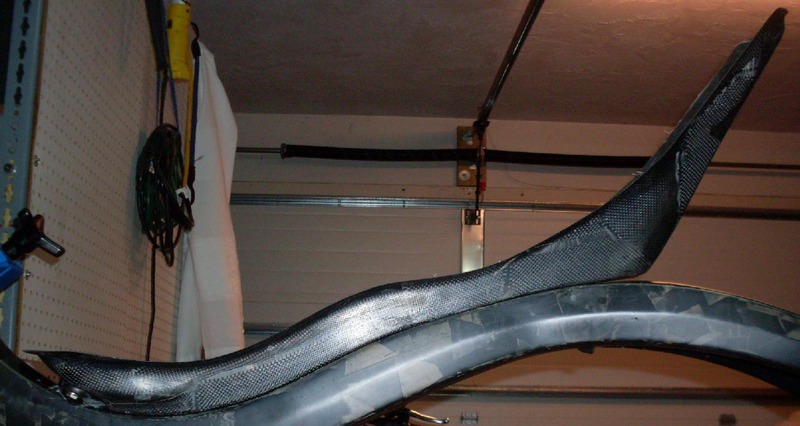 These ribs were made using the same technique as used for the stickbike seat ribs in that a laminated foam/carbon fiber core was hand shaped to fit the bottom of the seat. Additionally, the bottom of the rib had to be shaped to fit the top of the frame. The task of correctly shaping two 3D complex curves while keeping them properly oriented with respect to each other is quite tiresome and labor intensive. The new molded rib was bonded to the seat and two and a half layers of carbon fiber were wrapped and vacuum bagged over the entire rib to affix it to the seat bottom. Conveniently, it is now easier to locate and affix the two front threaded frame mount inserts as well as the rear frame thru-seat bolt mount. One can possibly envision the 3D curves required to fit both the seat and the frame which made hand-shaping a laminated rib so difficult and time-consuming. This first rib was made using a prototype mold that was intended to just check the resulting shape and fit so was made in two steps that resulted in excess epoxy (thus extra weight) remaining in the rib. We will be making a production rib mold that can be made and vacuum bagged in one step which should bring the rib weight back down to desired values. Since the new rib sits slightly lower on the M5 frame, we had to make a new tailbox wheel well mold which is slightly deeper and wider than previously required. The new wheel well handles 25c tires much better than the old. Unfortunately this almost cuts the tailbox in half and interferes with access around the bottle holders. Earlier prototype tailboxes didn't implement a bottle holder floor but were basically just cylinders that had a loop of Velcro affixed on the inside and bottom to cradle the water bottle. We elected to cut the bottom of the bottle holders off on this seat to see how they worked. I am very pleased with the result. I don't notice any bad effects other than that there are now two large, open holes in the top of the tailbox... The holders work as before except they are slightly quieter and one can much more easily reach areas under and in front of the holders when there is no bottle installed. The trailing edge of the new rib was shaped to fit the contour of a rear 25c tire to improve the aerodynamics of the rib directly in front of the rear wheel. And yes, it is very noticably faster. Pictured below is the seat used to create the new rib mold mounted on a very pretty blue M5. This seat was first made with the old style laminated rib which was carefully shaped for the mold, then the seat was prepped, tooling gelcoat covered the rib then several layers of fiberglass. The mold was then removed and the seat was reconditioned and mounted to this M5. We made a male plug from the prototype rib split female mold and were planning on making a production split female mold from that. We decided to make a production mold from the male plug instead so we wouldn't have to deal with a split mold. The first part came off very easily and looked so great that we decided to go with the male plug as a production mold instead. Too bad this beautiful part will not be visible. It will be bonded to the seat under two layers of carbon fiber.